If productivity is a form of creativity, then we certainly have to acknowledge the outstanding creative output of Allison Joseph. Few poets of her generation have produced so many volumes of poetry. Her books include What Keeps us Here (1992), Soul Train (1997), In Every Seam (1997), Imitation of Life (2003), Worldly Pleasures (2004), Voice: Poems (2009), and my father’s kites: poems (2010). Word on the street is that she has more works on the way. 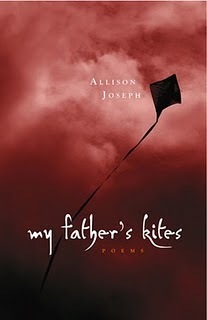 I was recently really struck by the extent to which Joseph channels her considerable creative energies in my father’s kites; the book contains a sequence of thirty-four sonnets focusing on her father and his death. What artistic and emotional fortitude must one possess to produce so many interrelated sonnets about the loss of a parent? Joseph’s sonnets about her father do not only reside in the realm of tribute. She questions some of his behavior; she describes the belongings he left behind (credit cards, business cards, a camera, and more); she discusses the funeral arrangements. She compresses, no, molds all these reflections and considerations into 14-line poems, with variations of rhyme schemes. So while Joseph’s artistic productivity is apparent in the numbers of volumes she has published, we can also witness her high level of creative output in the sequence of sonnets in my father’s kites. And speaking of artistic productivity, it would be worth discussing Joseph’s work in relation to the high levels of creative output displayed by Elizabeth Alexander, Amiri Baraka, Kevin Young, and the late Lucille Clifton, to name a few. I guess, too, we’d need to mention the role that institutional support such as publishers play in sustaining poets, or at least in making their work visible.